It didn’t seem like any big deal. I was helping a friend do a mail-out and needed to pick up the letters and envelopes. So I called her and asked how much paper was involved. I just wanted to figure out if I needed to walk by her place before or after I did my other errands. If there was a lot of paper involved, I’d go by after the errands so I didn’t have to carry it around all day. Seemed pretty normal to me, but then I’ve been getting around without a car for almost two years now and my friend totally relies on hers. So she was a little surprised and not sure what to make of it. But as I later explained, it’s what I do. 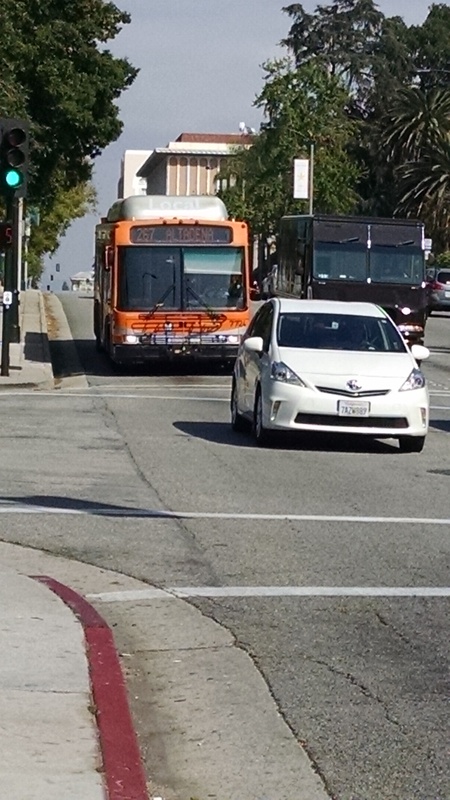 You see, it’s not that hard to get around Los Angeles without a car. But it does take some planning. If I need to get groceries for the week, I have to think about doing so before I leave home. I do keep some of those grocery bags that fold up into small packets in my backpack. But if I’m going to be getting milk and other heavy items, I generally need my granny cart. People talk about living in the moment – and I generally prefer to. I just can’t all the time. I have to think two and three steps ahead sometimes because I have to account for the possibility of late buses. Or what the weather might be doing. Or what I’ll have to carry with me or bring home. I think about grabbing lunch in terms of whether I have time before the next bus comes – and it’s always a bit dicey when the lunch counter takes its sweet time and if I miss the coming bus, I’ll have to wait another hour. I once had a shop owner offer to make me a waffle and bring it to me at the stop. That way, if I had to leave before the waffle was ready, I didn’t have to pay for it. He got there in time and it was a damn good waffle. So tomorrow is the trip to the podiatrist. I have a meeting with another friend after that and had to think about getting her mobile number just in case the bus runs late. Oh, and I really should have set the time for the meeting after I’d checked out how I was going to get to the podiatrist’s office. Oops. But I have her number. It’ll work out. At least, I’m planning on it.